Where does the train stop for service? Who maintains the tracks? Why do the people with axes put fish blood on their weapons before fighting? Since they walked through the whole train, where is the bathroom? How do they fix bullet holes in the glass? From where do they get drugs? Why? How? Who? When? What? Those who didn’t like Snowpiercer keep their questions coming at IMDb. I think they’re playing a game where the one who comes up with the largest amount of questions wins. The leader so far is up at 22. Many of those questions make perfectly sense. The idea that the large majority of mankind would succumb in a climate catastrophe and that the few that are left will be eternally caught in a train that goes round and round the globe is pretty far out, so to say. Yet I think asking all those things, analysing every little detail, is senseless. It’s like nitpicking A Trip to the Moon by Méliès: How could that cannon possibly shoot people all the way to the moon, it doesn’t look as if it’s up for it? Why can the travellers breathe as they’re leaving the rocket, they don’t have en proper space suits? And why does the moon have a face, everyone knows it’s just a piece of stone? 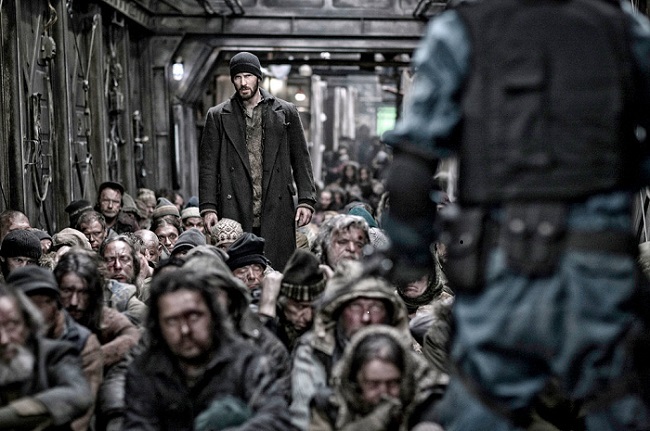 It’s perfectly clear from the beginning of Snowpiercer what it is: a movie that is firmly grounded in the realm of imagination. It’s not aspiring to be a plausible vision of the future. It’s a fairy tale for grownups, tickling, fun and entertaining, with an inclination towards the dark and morbid. If you want to you can brood over the obvious allegorical element to it. The train is strictly divided in different areas for different classes. The few privileged people in the front lead a very different life to the poor ones in the tail. The resources are limited and far from evenly distributed. Life remains unfair. But to me it wasn’t the symbolism that stuck with me. I just enjoyed the Gilliamesque art direction, and as the protagonist advanced through the train on his pursuit for a revolution, every new wagon became like a secret box to open. You never knew what was waiting on the other side on the door, more than that it probably would be more dangerous than pleasant. There was only one little detail in Snowpiercer that kept it from getting the highest rating from me. As much as I love Tilda Swinton, I had a hard time embracing her over-the-top comic relief character. But I think it’s mostly a matter of personal taste. Some people love fresh coriander in their food. I hate it. I think it tastes like soap. And that’s how I feel about this kind of exaggerated characters and acting. It tastes artificial. A hint of coriander. But that’s just a minor thing, nothing major. All in all I loved it. There’s only one question that needs to be asked about Snowpiercer. What were they thinking when they decided not to show on any big screen in Sweden? Straight to DVD in October, are you serious? It’s really a shame. It would have deserved a lot better. 1 it doesn’t have to stop for service, part of the “perpetual engine” concept. And anything that does need service has to be handled on the move, hence the manual replacements. 2. The tracks are engineered to hold up for many years, if one goes bad they’re screwed. 3. It’s done for two reasons: it’s more visually interesting to the viewer and it’s an intimidation tactic to the rebels. 4. From the looks of it there are at least 50+ cars in the train. The viewer only saw a dozen or so. 6. The drug is industrial waste that probably collects in some recess of the train. I know you didn’t ask for answers and it’s things like that which keep me from IMDB. Most of the sites and podcasts I frequent don’t bother asking those questions but I’m not completely opposed to them when it makes you think about the world they’re in as long as it’s sole intention isn’t just to poke holes in the movie. I also find it interesting that you didn’t care for Tilda Swinton, most people claim her as one of the best things about it. I’m a bit indifferent, I thought she was another well placed cog in a finely tuned engine, pun intended. Great movie. I agree that the questions sometimes can be entertaining. But it depends on in what spirit they’re put. If the only idea is to prove that the movie is flawed, it gets annoying after a while. Especially when it’s a movie like this, which in no way at all claims to be realistic. Re Tilda Swinton I enjoyed her to some extent. The shoe-line, already quoted a lot, was memorable. But after a while I felt I had had enough of that woman with the shrill voice. Great review. I can’t wait to see this one! Oh, and I too hate coriander. Thanks! And regarding coriander, I think we’ve got something in common in our genes. Yeah. I actually like it when cooked, or in a sauce or cream, But fresh coriander (cilantro, as we call it here) is so disgusting. I think it’s fine when it’s dried. But when you take fresh leaves, either you cook them or not, you feel the soap taste. Yak! Your views on fresh coriander made me laugh out loud. It’s disgusting! And it sneaks its way into more and more restaurant food these days. Beware of anything that has taken inspiration from Asia. The green you see is not basil, persil or oregano. It’s most likely coriander. It’s one for the cult classics I think.. the type of movie that the movie buffs will discuss in the future as one of THOSE movies that just stuck with them. I liked the vibe of it, the colors, the fact that the hero of the story was also shown as a villain in a way.. I loved Jamie Bell but then again, I always love him.. Tilda was too out there, yes, but still, she kind of brightened things up a bit.. and scruffy Chris Evans – I mean.. hello, there! Jamie Bell was wonderful! I’ve had a sweet spot for Billy Elliot and it’s wonderful to see that he’s become one of those child actors who hold up when they grow up. Not everyone does. Very nicely put, Jessica. I too had those questions you listed in the beginning, but soon came to the conclusion that it really didn’t matter. The look and feel of the film got me. It’s rare that you can really get a sense of the feeling of a film and get that tactile feedback from it. But Snowpiercer did that for me. Side note, this could make a pretty awesome console/PC game. Yes! I would love that! I wouldn’t be surprised if there already is one or at least one on the way. It’s based on a comic book, so why not bring it to several other media channels once you get goig? I didn’t really mind Swinton that much, but did not see her as a straightforward comic relief either. Over the top, sure, but that seems to be her thing lately. I do prefer her more tuned down version. As in We Need to Talk about Kevin. Glad to hear you liked the film, I loved it myself. I wasn’t bothered by those annoying questions. Once I find myself asking one, my liking of a movie quickly goes down as more and more questions, all variations on “this makes no sense”, follow. The movie just looks so nice. Wagons with fish, the strange school wagon, sauna’s, dance clubs… I can still conjure up those images. Yes, it’s bee a while since I watched it now, but it’s very clear in my memory. It’s definitely one of the movies that will stick out wen I think back of 2014. Quite enjoyed this one myself as well. Agree with you on Tilda Swinton, her character did feel kind of out of place. Yay! Glad you liked it. It’s definitely one of the movies from this year that I’ll remember. It’s very distinct in its style.